Canton DM100 review | What Hi-Fi? Canton has been a vanguard for quality soundbases ever since they became a ‘thing’, so when we say we expect big things from its new models we don’t mean in the literal sense. Hence we are surprised by its DM100, which is, to steal a Death Cab for Cutie lyric, wide enough for a marching band to march out of. Apparently Canton’s 72cm-wide DM75, designed for ‘the larger telly’, wasn’t plus-size enough because the DM100 takes that to almost a metre. It may seem like overkill when you lift its enormous carcass out of the box, but when you consider that more and more large premium tellies sit atop impractically wide stands (those on the Panasonic 65DX902B and LG UF950V, for example, stretch almost their entire 145cm width), it’s not a bad idea at all. The DM100 exists alongside the new versions of the smaller DM55 (£330) and DM75 Glass (£400), which all now have very smart glass tops. Despite its size, it’s easy to see our black sample (it comes in silver too) as an extension of our TV rack thanks to its sleek, minimalist design. We like how it only raises the telly 7cm, too. It doesn’t waste space either; driver count hits double digits with two tweeters, four midrange drivers (two more than the DM75) and four downfiring subwoofers, its built-in amplification serving up a hearty 200W of power. Like its siblings, there’s aptX Bluetooth streaming onboard, as well as two digital inputs (optical and coaxial), an analogue input and subwoofer output. Similar too is the blue LED text display and pleasingly substantial remote, which controls volume, input, bass/treble adjustment, surround and stereo modes and Bluetooth pairing. 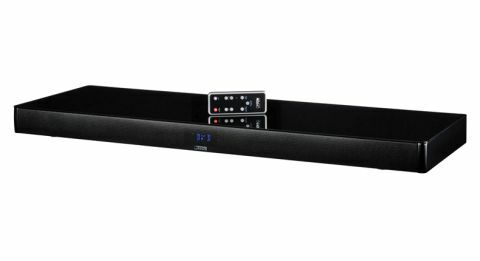 There are more functions than the sparse layout of buttons suggests though; holding the ‘sound’ button for three seconds enters an extended menu where you can adjust lip sync, subwoofer output and EQ depending on whether the DM100 is in a rack, on a sideboard next to a wall-mounted TV, or sat on top of a TV. Dynamic range can also be limited for when the kids are tucked up, and the Canton can be set-up to automatically turn off when a signal isn’t detected through its optical and coaxial inputs. Big base, big sound? There’s no bombshell to be dropped here; thinking back to the DM75 and DM55, the DM100 is exactly what we expect: expansive, powerful, solid and dynamic – all things you need to make the most of Jurassic World. In the calm before the storm, animal noises and the rustling of leaves in the enclosure are layered in the soundfield with a real sense of texture and detail, not to mention space. While it throws out a big expanse of sound, it takes similar care to ensure it’s all well integrated. Chris Platt’s voice is expressive and direct as he yells out commands to the velociraptors, even if the Geneva Model Cinema brings more midrange richness and clarity to the projection. Anything in the upper treble region, like splintering glass, can push the Canton’s top end ever so slightly over the wrong side of the line, but it’s never uncomfortable. When things get hairy for Platt and co, the Canton’s revealing dynamics comes to the fore. It doesn’t hold back in the final Indominus Rex versus T-Rex showdown – crashes are forceful, swipes have impact – and the same rapturous score that is almost disregarded like a dirty nappy through the TV speakers come through the Canton fiercely with power and purpose. That’s not without subtlety either; there’s plenty of gear changes and finesse to the proceedings. The subwoofers really go to work when they have to, and are capable of producing more bass than the Geneva. They get underneath each of the Indominus’ stomps, and there’s a brow-raising sense of power behind the Mosasaurus as it roars out of the water Shamu-style. There’s enough bombastic bass here to put off investing in a separate subwoofer, or even turning up the Canton’s bass levels past +1. That taut low-end is exercised with control and precision as it thrusts its agile hips into the bass line of Billie Jean in Michel Jackson’s This Is It. Keyboards bounce along enthusiastically, with dynamic subtlety, during The Way You Make Me Feel, and explosive moments throughout the footage are exactly that. The mammoth Canton DM100 may not be a soundbase for the everyman, but for anyone after a significant audio upgrade for a TV that warrants a large base, we can’t think of many better up for the job.